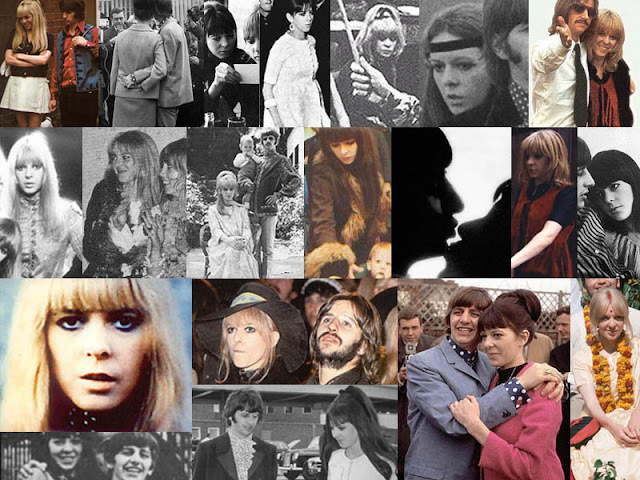 Maureen Cox Starkey was the first wife of Ringo Starr, who he married in 1965. During their ten-year marriage, "Mo" (as she was often referred) developed a keen style - from Liverpool sweatheart wearing skirt suits, houndstooth coats, kitten heels and silk blouses to Rock'n'Roll goddess in her over-the-knee boots, babydoll dresses, and velvet short shorts. 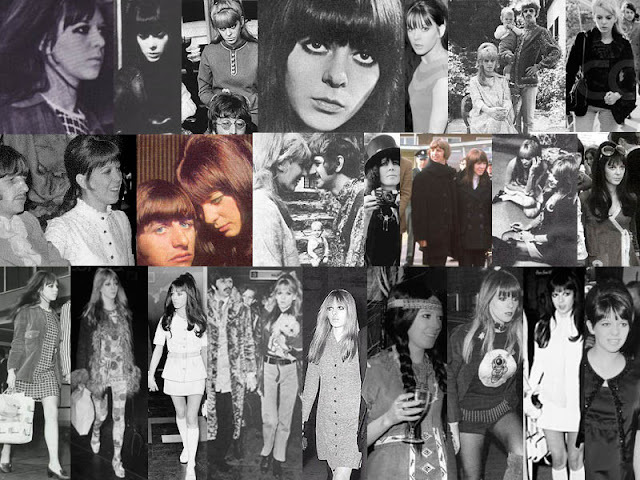 She rocked the Sixties dollybird staple - great long hair with blunt fringe. But whether she was a peroxide blonde or her natural raven-colored hue, Maureen always seemed to have fun! Born in Liverpool, Maureen left school at sixteen to become a hairdresser in 1962. Around that time, she started frequenting the Cavern Club and became a fan of the Beatles, who performed there often. She took a particular liking to the band's drummer. After a while she and Ringo began dating, which proved to be both a dream and a nightmare for Mo. 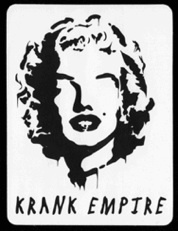 While she like Ringo and thought the music was great, she was unconcerned with his band's growing fame and was quite alarmed by the vicious reactions she received from fans. On Valentine's Day 1963, she was cut on the face by a fan while waiting outside for Ringo in the car. But still Maureen and Ringo kept dating. When Ringo was hospitalized in 1964 for tonsilitis, Maureen rushed to London to stay by his side and nurse him back to health. Maureen's down-to-earth and generous nature was not overlooked by Ringo, who proposed to her in early 1965. In February, a now-18 Maureen married 24-year-old Ringo. Their first child, a boy named Zak, was born seven months later. Over the course of their decade-long marriage, they would have two more children. Mo and Ringo were very much in love, but still problems arose in their marriage. Ringo grew to develop an alcohol problem and there was infidelity by both parties. But Maureen, who had an affair with George Harrison, still loved her husband and didn't want a divorce. Eventually she relented and she divorced Ringo, citing his affair with Nancy Andrews as main reason. In Cyn Lennon's book "John," Maureen was apparently depressed for several years following her divorce from Ringo. Eventually she moved on, marrying Hard Rock Cafe & House of Blues founder Isaac Tigrett in 1989. Tigrett The couple had a daughter together two years prior. jokingly referred his new bride as "my greatest piece of rock memorabilia." But even after she embarked on a new life with her new family, the Starkey clan remained close. Ringo has said, "Three years ago I started working again after a long break, and the whole family, including Maureen, came to the gigs... We're like that. We go as a family to support the family. Even though we're divorced, me and Maureen still share the joy of being part of the same family." On New Year's Eve 1994, Maureen lost her battle to leukemia; she was 48 years old. Along with her children, her mother, and her husband Isaac Tigrett, her ex Ringo was holding her hand when she passed away. Ringo was reportedly said that when Maureen passed away, a part of his soul died as well. The song "Little Willow" (a heartbreaking beautiful song if you've never heard it) off of Paul McCartney's "Flaming Pie" album was dedicated in her memory.